Enjoying pets can be a wonderful part of family life. 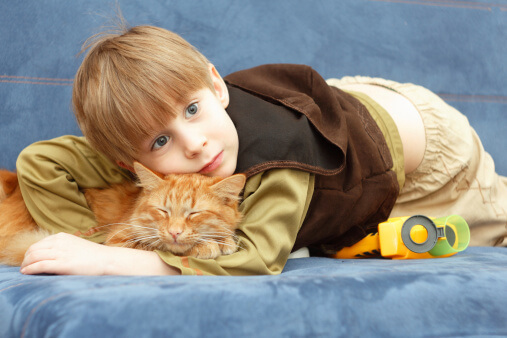 Besides being beloved companions, pets can help children learn empathy, responsibility, and can help their immune systems learn how to minimize allergies. But since the mad cow scare in the U.S., many parents have been wondering if their pets are safe. During the height of the mad cow outbreak in the United Kingdom, about 100 cats – about as many cats as people -contracted the disease. Many suspect that the British cats were infected by eating contaminated cat food, but this has not been proven. The risk to cats is low, but real. The sick cats should not be a risk to humans. No dogs have been reported to have become ill. The USDA, to its credit, has now moved decisively to prohibit diseased, downed, or dead cattle from entering the U.S. human food supply. However, animals not fit for human consumption might still be used for pet food. The dead animals are processed for pets in a way that is thought to prevent most diseases. I’m glad, though, that my cat likes food make from chicken and fish.